What is the ModernGraham Book Club? 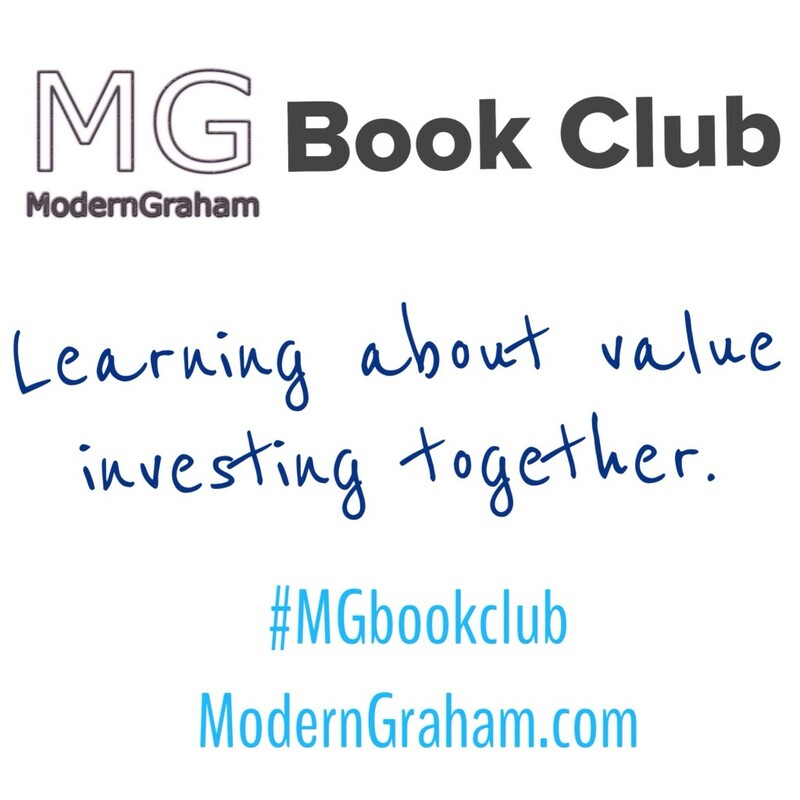 The ModernGraham Book Club is a community where value investors can come together each week to discuss and learn as a group about investing. This is a place you can come to find good books, good insight, and good conversation. Hopefully as you participate you will learn more about value investing and other related topics. Anybody can participate, regardless of investing knowledge. The ModernGraham Book Club is intended to be suitable for investors of all levels. If you don’t know a single thing about investing, or if you are a hedge fund manager with years of experience, you are welcome to participate. In fact, the more diversity in knowledge levels, the greater the experience will be for all. Oh, and the whole thing is free to participate. No purchase necessary, though you may find it a little more useful if you purchase the books. How often will we discuss? Every Sundays, there will be a post on ModernGraham.com where the discussion leader will give thoughts on the reading for that week, and readers are encouraged to participate in the discussion by commenting on the post. The weekly readings will be fairly short, so if you miss a week or two it will be easy to catch up. I am having trouble finding the link to Chapter 5? Can some one help me with this? Chapter 6 discussion has no active link above. Am I just trying to comment too soon? Richard, Thanks for the reminder! The link has now been added. This is your reminder to activate the link to chapter 7. LOL. Thanks, Richard. It’s updated now. One of these weeks I’ll remember to put the link here on Monday. Thanks for encouraging me to read the Intelligent Investor again. I got more out of this reread than I thought I would have. The chapter-a-week pace was an excellent incentive to keep me reading and not let life’s distractions slow me down. I hope you are you planning to begin another book upon completion of the Intelligent Investor. If so, and given a chance to voice opinion, my vote would be: Security Analysis by Graham and Dodd. Thanks again. P.S. Remember to activate the link to chapter 19. Nice site! Can you add the links for the last two chapters? Are you considering other books? Greetings, could you please direct me to the Book Club comments/links for Chapters 4-10 of Business Adventures. RH – The Business Adventures discussions have been put on hold for now as we didn’t get enough of a response for discussions. Hi Ben, it was the chapter about the IRS that did ’em in…almost didn’t get through it myself…whew, glad that one’s done, rest of the book is good..too bad discussion is on hold. Hope you’ll do another. Appreciate all you do, best to you. Thanks.